A simple search for MPG to AVI converter will return a diverse range of converters which claims to convert MPG video to AVI format with the best quality and performance. However, not all perform as well as Aimersoft Video Converter Ultimate. Aimersoft is one of the leading names when it comes to video converter for Windows. Completely compatible with Windows 8, 7, XP and vista, the software provides simple and quick solution to convert almost any video and DVD into desired format. One of the best features of Aimersoft Video Converter Ultimate is its ability to transform MPG to AVI file format. The video converted by the app can be easily exported in high definition format. It also comes with features like 3D and 2D enhancements and can also enhance your videos for fine home theatre preview. Ripping, burning DVD is also an added attraction to the software. Another awesome feature is the ability to download and record streaming videos from sites like YouTube, CNN, yahoo, Google and more. If you want to convert MPG video files to AVI format, just take advantage of the Mac version of MPG to AVI Converter - Aimersoft Video Converter for Mac. This program is well versed in converting over 50 popular video and audio formats and performs well on Mac OS (Mountain Lion). The first step is to install the application and run it on your computer. Simply click "Add Files" and you can import the MPG video files into this program. You can load MPG files by directly dragging and dropping the video files into the main window of this program. Ones the files are imported into the software click the pull down arrow of the Output Format option on the right side of the window. Select AVI as the output format. To adjust advanced settings, click Settings button on the right bottom of the window and manage the settings as per your need. 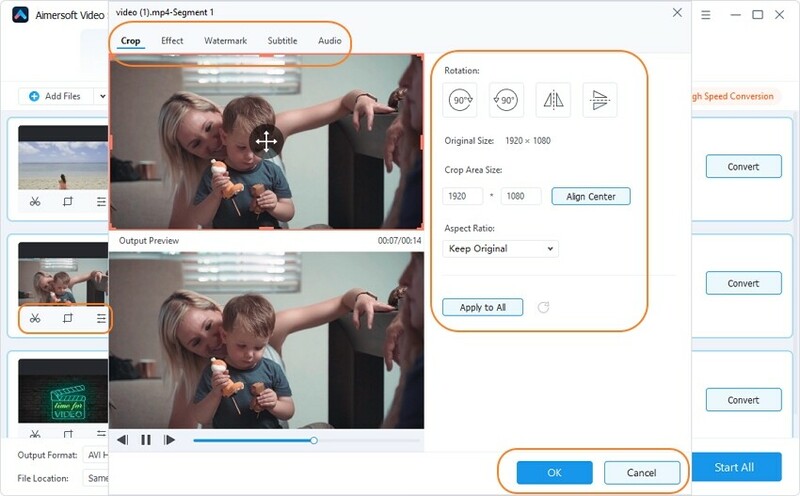 By clicking the Edit button beside the video file to open the video editing window and create personalized video visual effects. Choose an output folder to save the output files. Once all the settings are done click on the Convert button and your converted files will be saved in the locations you have selected. The ability for your program to convert mpg to avi is impressive in itself, but my absolute favorite is how we are able to tweak the video effects and add brightness to some of the more darker films (I find this is a problem in general with animated movies, no idea why). I do use the watermark feature sometimes as well, especially when I am making family videos to make sure people don't blatantly rip off my content.